This is the biggest quilt I have ever made measuring at about 41" by 48" and consisting of 30 blocks. I used the sweetest Dandelion fabric by Belle and Boo and Memoire a Paris by Lecien, and a few more florals. 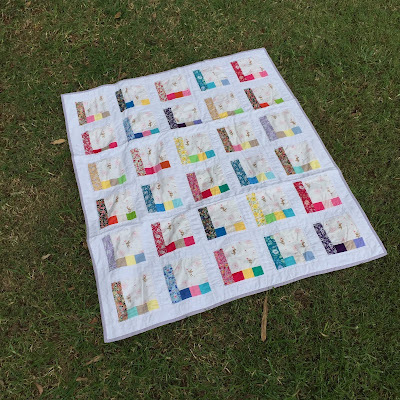 I used Homespun Prima solids mostly, the white one is Kona, but if I was making this quilt now, I would choose Kona solids only because of the higher quality. I am thinking of growing my Kona solids stash slowly. For the binding I tried different colours and prints, but settled on the solid lilac that frames the quilt beautifully. It was the longest bias tape I have ever made and it was so fun. I mentioned that I was having a "love and hate" relationship with this quilt because I changed my mind on the arrangement of the pieces within the block and the block placement so many times that at some points I wished to simply forget about this quilt altogether and never come back to it. I even made a few blocks in a completely different design, but then after some thinking I finally settled on the original idea with a few small changes. I am so glad I persevered and kept going because now this quilt makes me smile every time I look at it. All these bunnies floating around pretty petals are simply adorable and the colourful squares add some rainbow fun. 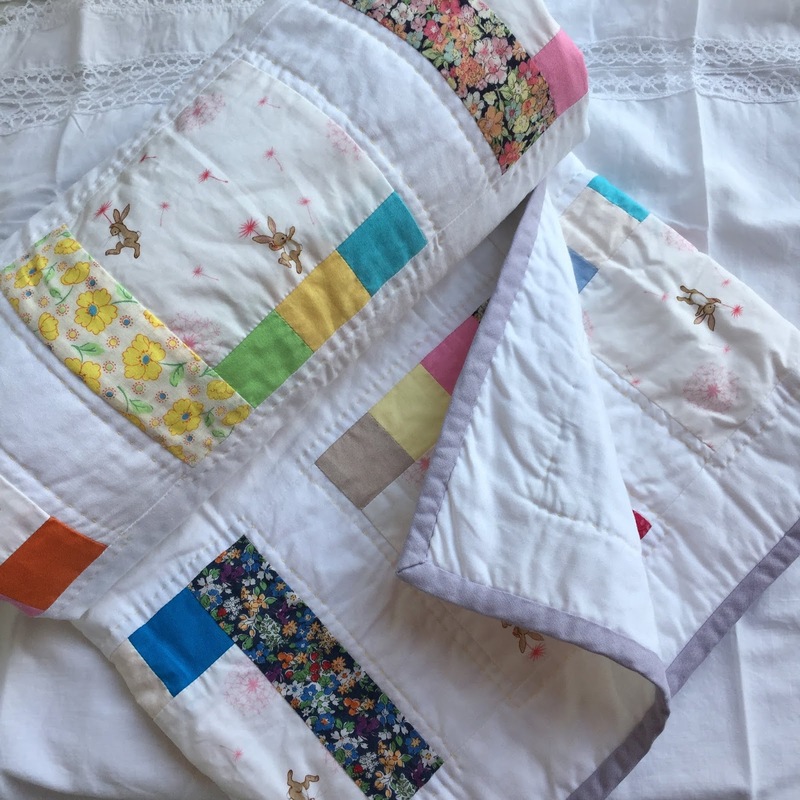 I was a little bit worried that by the time I finish this quilt, my Little One would not like the idea of flowers and all the pinks in his quilt, but would rather ask for cars, tractors and trains on his quilt. But every time I was working on this quilt, he kept asking me when it would be ready for him to use and kept saying how pretty the flowers were and how cute were the bunnies. His sweet comments kept me going. I hand quilted this baby using a pale yellow Gutermann quilting cotton. Tiny stitches going around each block that are hardly noticeable, but giving a lovely texture to the quilt. I wanted to add a bit more stitching, but honestly was afraid that if I do that, the quilt would not be finished at all. It was around 8 in the evening when I was finishing the last stitches of the binding and my Little One could hardly wait. So as I.
I rolled the quilt and gave it to my Little One. Oh my goodness! What a feeling it was! Seeing my Little One unrolling it and looking at it with eyes full of amusement and excitement, jumping up and down, squealing, hiding under it... testing it, making sure that it was good enough to sleep under. He was not very happy when I told him that I still needed to wash and dry it, but he agreed to wait a bit longer and now he snuggles under it every night with his favourite softies. 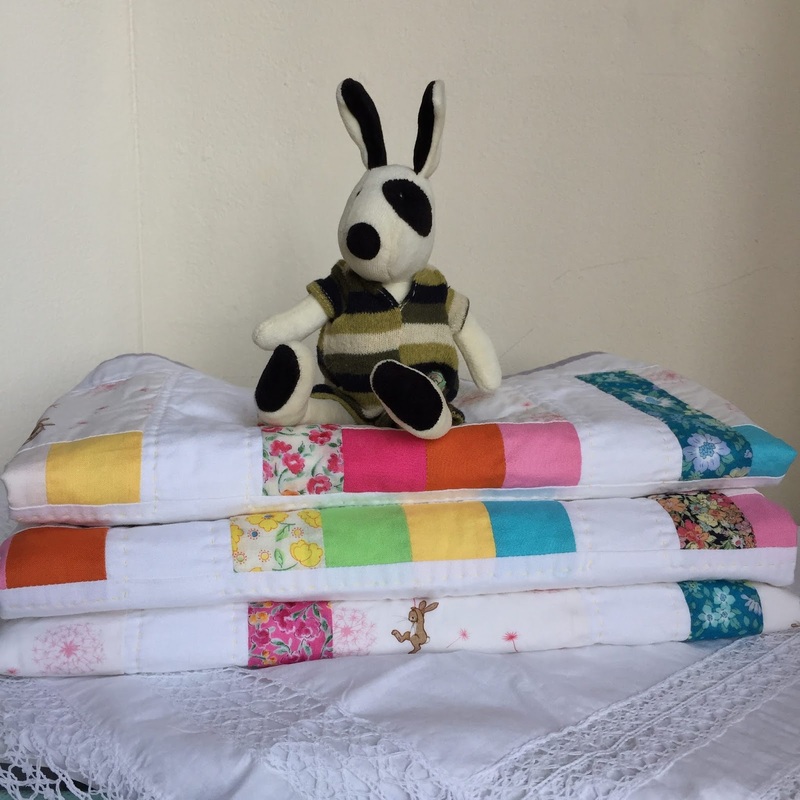 Fabric with bunny is so cute. Thank you very much, Jarka! This quilt is being used daily and my Little One loves it. This Belle and Boo fabric is really sweet! 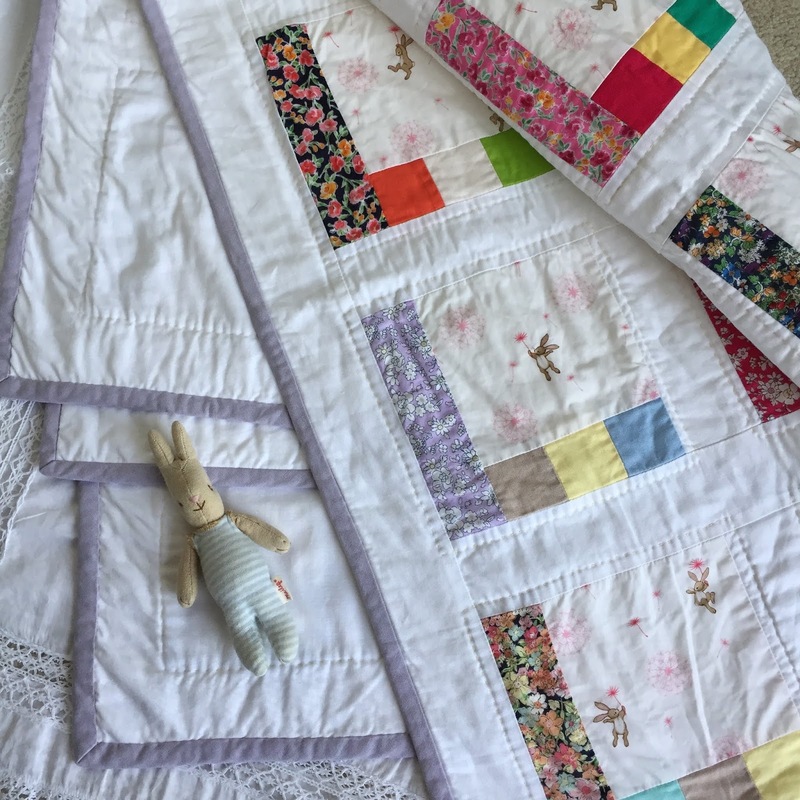 Such a sweet quilt - so glad a little bunny gets to snuggle with it now :)! What a gorgeous quilt! I really like the design of the blocks. No wonder your Little One was thrilled with it. Such a beautiful quilt and story! This is such a sweet quilt! You did a beautiful job on it. Oh what a wonderful feeling to know your little one loves it so much! It's been a few months now and we all love this quilt, it makes us all smile and make the snuggles even better. :-) Thank you, Kathleen! Did I overlook this quilt on instagram? I can't remember seeing it there and it so very pretty!What a cute idea and what a lovely quilt. Lots to see and look at for your little one!